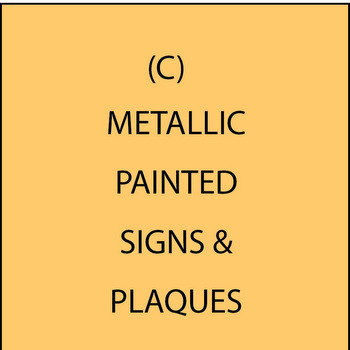 This section (C) shows provides information and shows photos of signs and plaques made with our metallic painting process . This is the least expensive option to give your sign or plaque a gold, silver, bronze, brass or copper look. It is considerably less expensive to paint a sign or plaque with a spray gun, airbrush, roller or artist brush than to metal-coat or gold -leaf the surface. However, even the finest of metallic paints do not have the appearance, especially the shine or luster, of the real metals we use in our coating and gilding processes. Many times, however, metallic paints are "good enough", and our plaques & signs painted with our metallic paints are just about half the price as metal coated or gilded plaques. You can compare their appearances by viewing sections (A) (metal-coated) and (B) (gilded) with this section (C) (metallic painted). The gold-leaf gilded plaques in Section (B) are considerably shinier than the gold painted signs in this Section (C). However, silver painted signs in this section are almost as shiny as the silver-gilded signs in (B). Bronze, brass and copper painted signs do not have the luster as the metal-coated signs in Section (A), which have the appearance of solid polished metals. We use the absolute best metallic paints available. We use Matthews two-part acrylic polyurethane paint (MAP) gold, brass and silver paint. We also use 1-Shot gold and silver enamels for letters and some artwork. Please click on "Return to List below right to see photos of over 100 bronze, brass, copper, gold, silver, stainless steel and aluminum plaques and signs.